Watch out, swimsuits are addictive... you can't make just one! Before I had finished my first one (the Stripey Soma), I was planning my next one. Part of that addiction is the Soma pattern itself-- I just love all of the variations, I want to make them all. 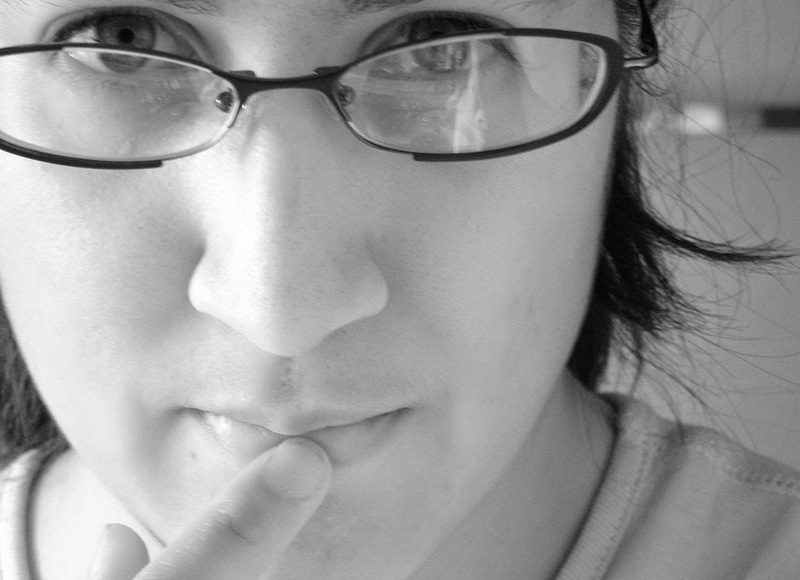 An added benefit is that the economizing side of my personality is feeling quite smug. Okay, lets do a bit of a tally. My last tankini was purchased many, many years ago from Title Nine Sports, and the going rate there is... $80 for a tankini top, and $50 for a bottom. ARE YOU KIDDING ME? That's $130 for the ensemble. Yikes. Of course, I probably would have done some economy shopping and found some sales or something, and I certainly wouldn't have bought two new suits for that price. Swimsuit supplies (SewSassy.com): $50 (swimwear elastic, bra strapping, foldover elastic, bra foam, black coated metal rings, lining in two colors, and $10 shipping). Lots leftover, BTW... enough to make a couple more suits! Okay, so that's not cheap, but considering the going price of quality swimwear, not bad, right? Of course, the best thing is that these suits are totally custom-- they have the fit, coverage, and features that I want in a suit, and that's worth quite a lot! About this fabric... I've actually had this swimsuit fabric in my stash for awhile. I bought it on total whim when it came up in the New Fabric listings at Emmaonesock.com. 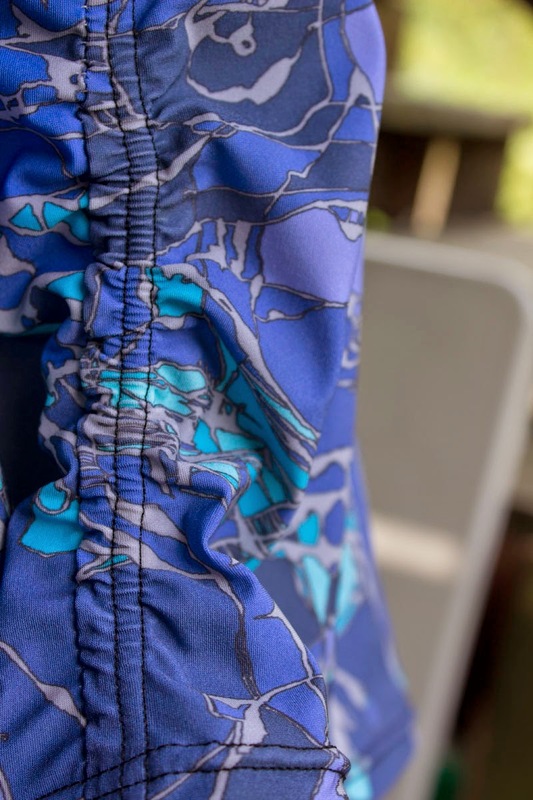 It was such a cool print, and how often do you see such a great print in a swimsuit fabric! It was listed as a "Peter Max" designer print, and I'm not sure if what was meant by that was that it was actually designed by Peter Max, or it just looks sort of Peter Max-esque. I'm going with the latter, since I have no evidence that it is the former. It isn't quite as psychedelic as most Peter Max prints... the colors are (to my delight!) rather harmonious. In looking around for great prints in swimwear fabrics, it seems to be slim pickings. I was a bit tempted by Girl Charlee, but I'm sort of glad I stuck with my stash and spandex world after Cashmerette's experience with a lack of colorfastness. I almost purchased that very same fabric! How disappointing to put all of that work into a garment and have the quality of the fabric be an issue. I'm at least glad that they refunded her purchase. But anyhow, I went with the stash for this one and I think it is a pretty darn awesome print. In fact, I'm going to put this forth as my first contribution to Tribute Month at Sewcialists. Don't you think Oonaballoona would looooove this print? I know, there was a whole Oonaballoona month last month, but I missed out and my admiration of her style is can't be contained in a single month! Anyhow, back to the swimsuit. It is another Soma, I was just dying to try the cross-front version. I considered the one-piece, but I was a little uncertain that the one piece would have enough chest support for my girls. I actually thought the bikini version looked more supportive, since it had a band right under the breasts, rather than all the way down at the waist. So I ended up making the cross-front bikini top variation, and adding a tube of fabric to make it into a tankini. Because, as I've alluded to in the past, my abs are otherwise occupied expanding and contracting to accommodate little human beings, and not all stages of that process are beach-worthy! The pattern came together pretty well. I followed the instructions for the most part, and made no fit adjustments until the very end. I actually found this version easier to sew than the last one since it didn't call for any zigzag topstitching, which I had such a problem with on the previous suit. Zigzagging the foldover elastic was no problem. The one thing that I ended up having to fix is that the fabric at the top of the bra cups, in the little triangle created by the foldover elastic straps, wanted to bunch up a bit. So I ended up needing to decrease the width of the top of the bra cup by about 1/2 an inch. I took the 1/2 inch off of the inside of the bra and graded it in toward the cleavage. This was actually a total mistake, I meant to do it on the outside near the armpit, but it was late and I was momentarily confused. As it is, my version is just a tiny bit more low cut, which is not really a problem. The arrow is pointing to the top of the bra cup, where I had to take off 1/2 inch to prevent gaping. I'm a bit embarrassed about that topstiching though, how sloppy! I also added bra cups. I had some removable shaped foam cups around from my former Lululemon tank obsession, and these were perfect. I just sewed the cups into the lining with a wide zigzag. I made a guess as to placement, and actually I think I probably could have placed them a bit more towards the center. I may have to fix this at some point to prevent wardrobe malfunctions, but I'm not yet convinced that it is a real problem. I had to make some decisions on how to finish the back of the suit with my tankini modification. I decided that the back clasp wasn't going to be useful, so I went with the crossed bra straps that are used in the one-piece version. I also sewed a bit of swimsuit elastic into the top of the tankini piece that would be exposed in the back to prevent gaping. And of course I crossed the straps in the back-- as has been previously noted, I have some of the world's most slopey shoulders. For this tankini, I decided to incorporate a bit of ruching on the sides. I simply cut a 5 inch piece of swimwear elastic, and then stretched it and sewed it down to about 7 inches of the seam allowance at the bottom of the tankini. I then topstitched the seam allowance down with my twin needle so that the elastic was encased and not against my skin. I also hemmed the tankini with a twin needle. One thing that frustrated me a bit was that I was completely unable to find foldover elastic in a 6/8ths width, which is what the pattern called for. I could only find 5/8ths width. Why does this matter, you ask? It's a small thing, but 6/8ths folded over would make a 3/8ths inch strap, which would have been the same width as the 3/8ths inch bra strapping. I know, it is a small detail, but it sort of irks me. I considered all sorts of ways to make the straps match. I briefly considered not folding the elastic in half equally... but that was super-duper fussy. I also thought about using the foldover elastic instead of bra strapping, but I liked the beefiness and softness of the bra strapping. So in the end I just went with it, and the 2.5/8ths folded elastic meets up with the 3/8ths bra strapping at the rings. If you are not staring at it, it is just fine really. But someone please tell me, can you get 6/8ths foldover elastic somewhere, or is it only available in New Zealand or something? The bottoms went together without a hitch. As in the previous version in black, I did all topstitching with my twin needle. The blue in this pick got a bit crazy! In reality it is more like the previous pics. In anycase, I love my new suit! I think the pattern provides great camouflage real or perceived figure flaws, and the styling is quite clever. Walking around Rome this spring, I couldn't stop admiring all of the great asymmetric jackets. 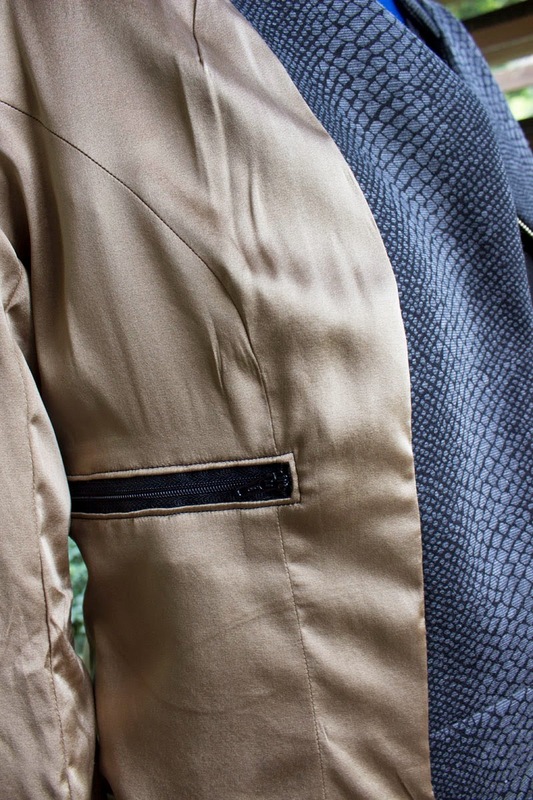 Some more moto, some more equestrian, made in wool, leather, canvas or cotton. I refrained from buying any-- instead, I came home with yards of italian wool! 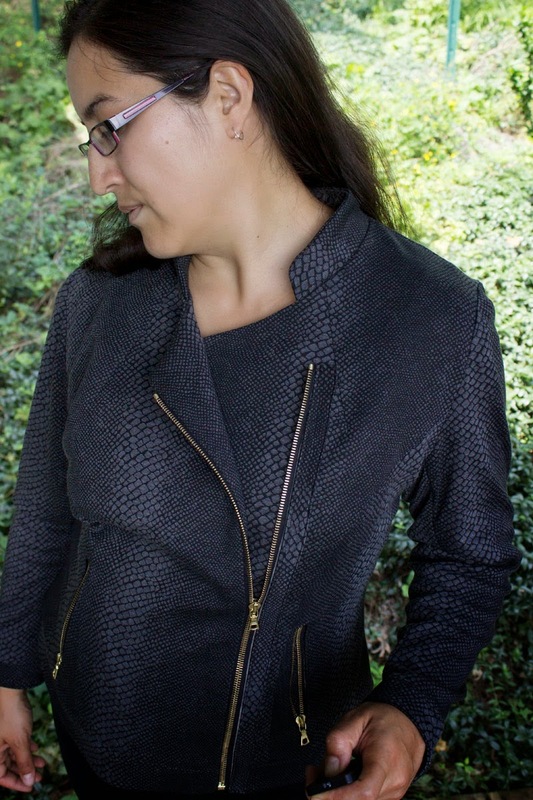 But when it came time to sit down and sew, I ended up pulling out this fabulous python ponte that I had picked up from Emmaonesock. I'm a little dubious about ponte as a jacket fabric... 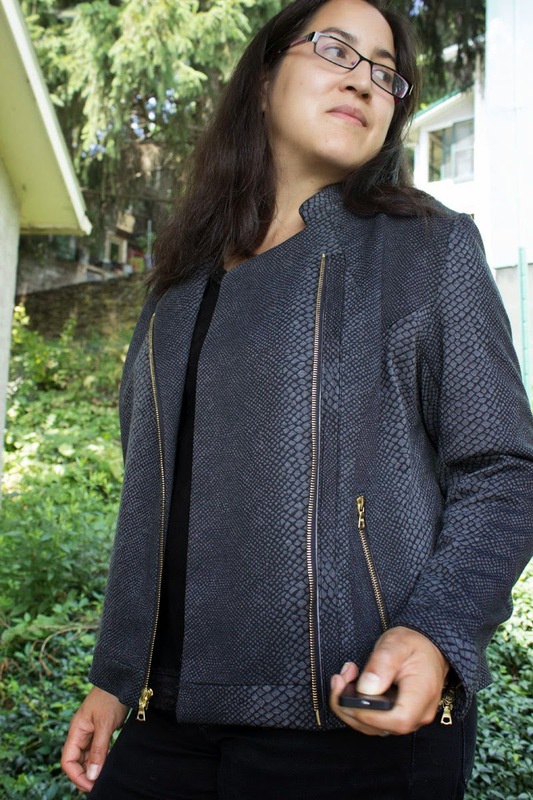 I had a RTW ponte blazer with me in Rome that pilled horribly. At the same time, I had a couple ponte tops made from ponte from Emmaonesock and Marcy Tilton that I wore constantly all spring and they didn't pill at all. 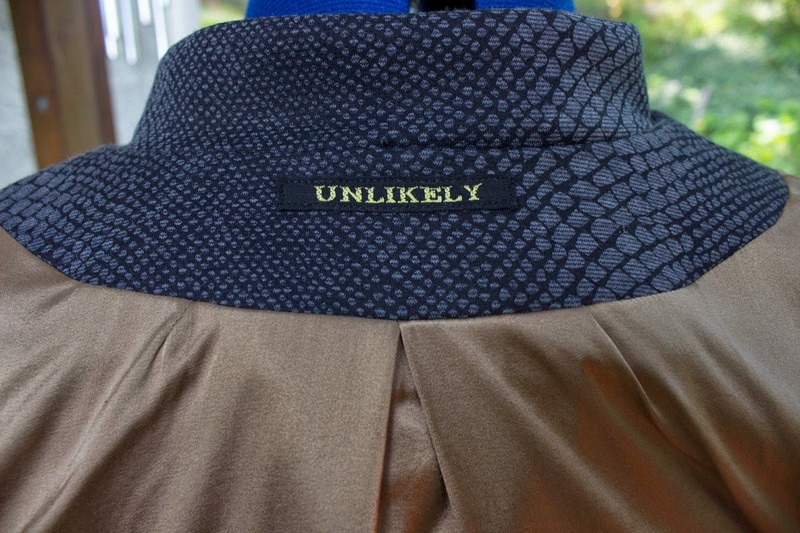 So I guess I'm hoping my ponte is higher quality and will fare better than that RTW blazer! 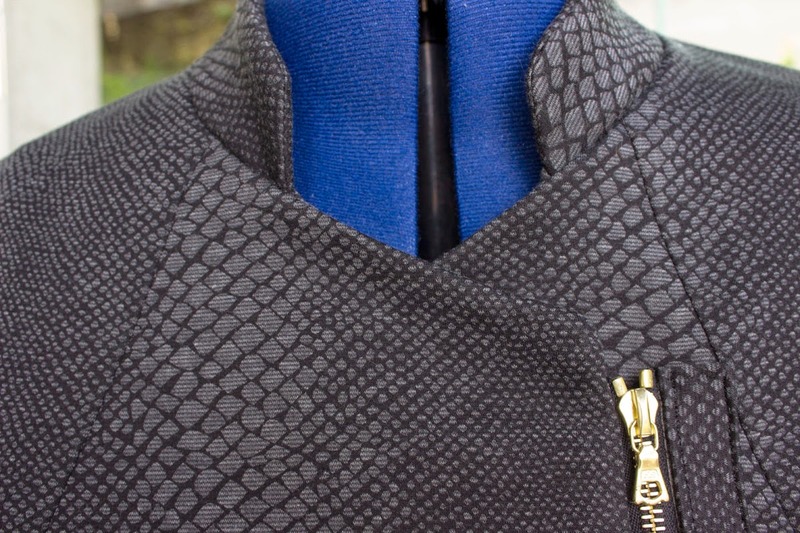 Just to tease me, I was halfway done with the blazer when I spotted a fantastic python denim at Emmaonesock... argh! 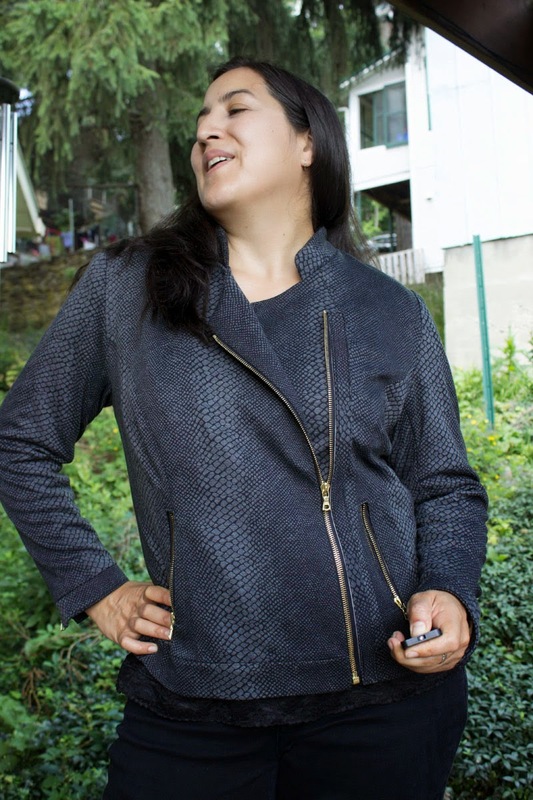 The pattern is the Burdastyle Asymmetric Jacket #116. This was actually my very first foray into Burdastyle patterns. My first muslin for the jacket was awful. Too narrow in the bust- and I NEVER have that problem. I had traced the 42, the largest size on the pattern I downloaded. The size chart said the bust was 37 3/4, and I usually measure a 38. The next size up has a bust of 39 1/2... what is a size 38 girl supposed to do? I hate that I'm always between pattern sizes! So I basically ended up trying to grade the bust up a size, and the hips out a size (or two). I also increased the size of the armholes and widened the sleeves. I basically redrew the whole pattern! A couple muslins later I had a viable pattern. I guess I should have guessed I'd have trouble... all people who have posted have mentioned how form fitting the pattern is, and they have mostly embraced the skin-tight look. But since I plan on wearing this at work over my usual tops, I want the fit to be a little more relaxed. Once I got to sewing, it came together pretty well. As is quite well known, Burdastyle directions are worse than useless, but how the pieces fit together was fairly self-explanatory. I found the cuffs to be difficult though. Trying to get the zipper to fit in smoothly and the cuffs to match perfectly was a B----! It would have been easier if the cuffs had been a single piece of fabric folded over, but for some reason I don't understand, they have a seam instead of a fold. In my opinion, just another place to introduce inconsistency. I'll definitely do it my way next time. 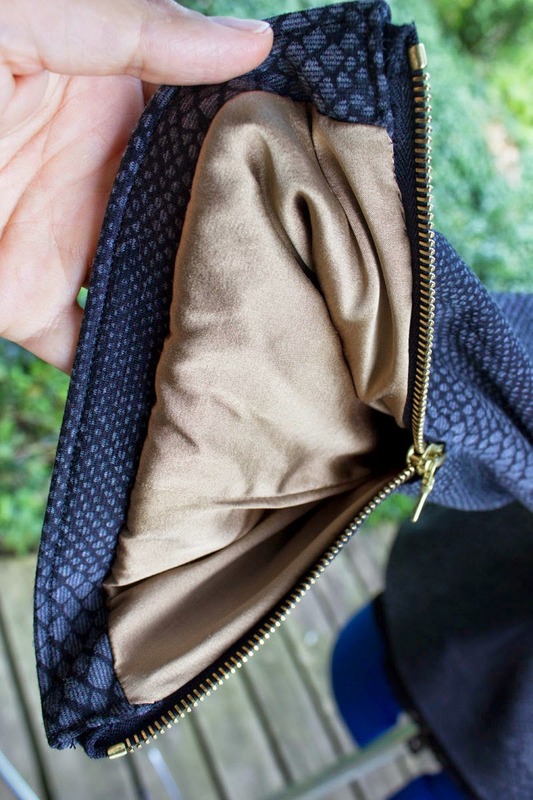 Of course, the lining had to be hand sewn to the zipper. I did the rest of the lining using the numerous "bagging" tutorials on the internet. 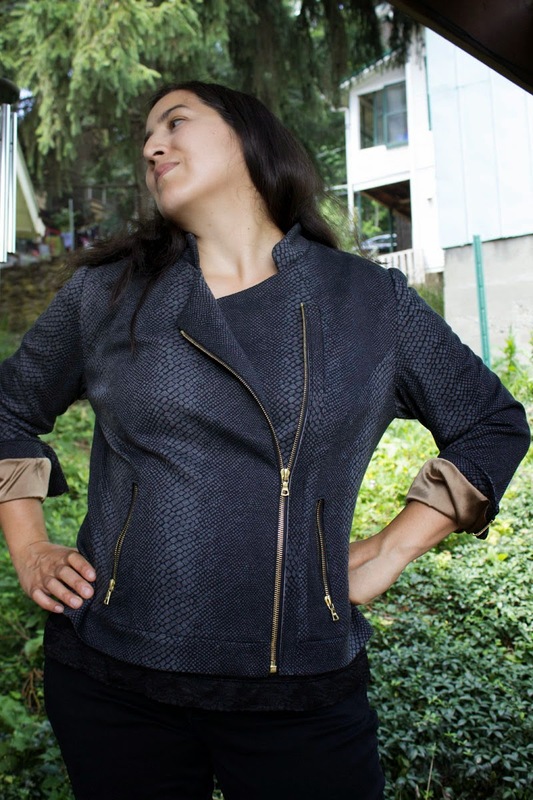 The rest of the jacket was pretty darn simple. The collar was totally non-fussy. Even installing the asymmetric zip was pretty straightforward. All of the zippers are Riri zippers from Pacific Trimmings. 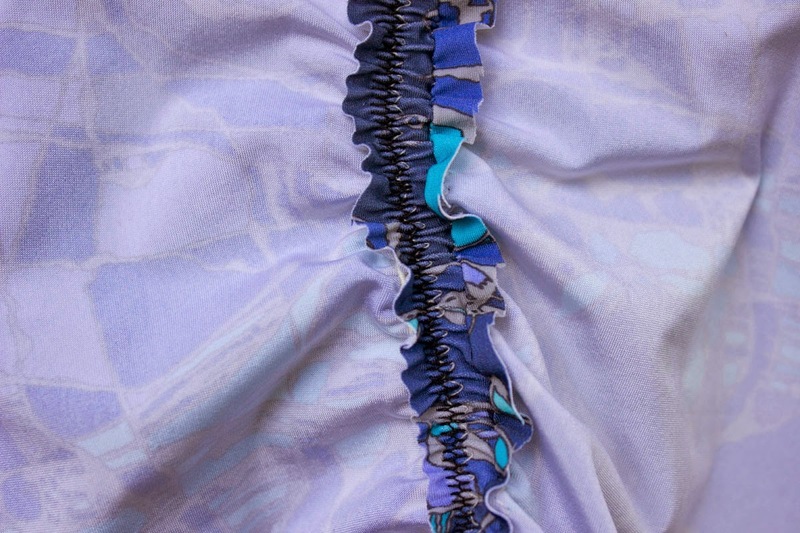 They are just awesome zippers. I used two long zippers, and cut them to length as needed. 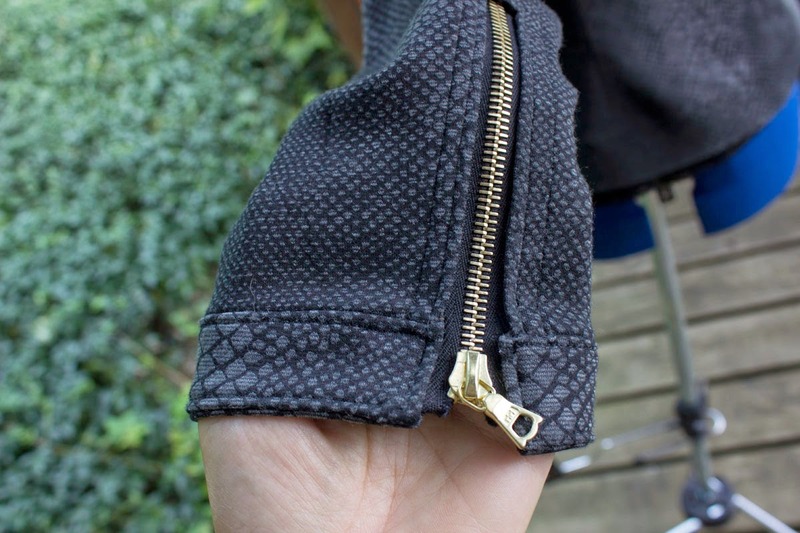 I bought extra zippers stops which installed with pliers on the cuffs and at the top of the separating zipper on the front of the jacket. For the pocket zips, I didn't bother with zippers stops. 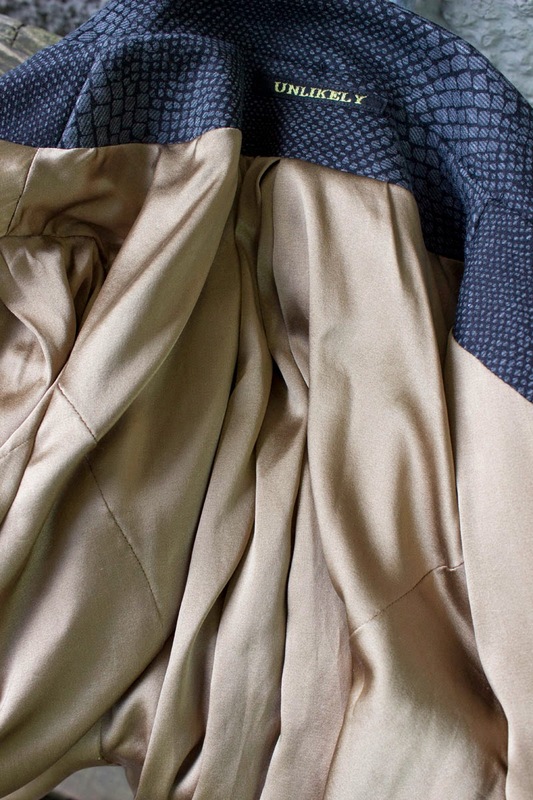 The lining is stretch silk charmeuse from Mood. The lining would have been straightforward too, had I not cut out the WRONG part of the front jacket piece! It looked totally wonky, and I had to tear it all out and do it over. Unfortunately, that means I had to do the zipper in the lining twice too! Argh! I could just have done away with it, but I just love having interior pockets too much, and I sucked it up and did it all over again with the right pattern piece. So that's about it! 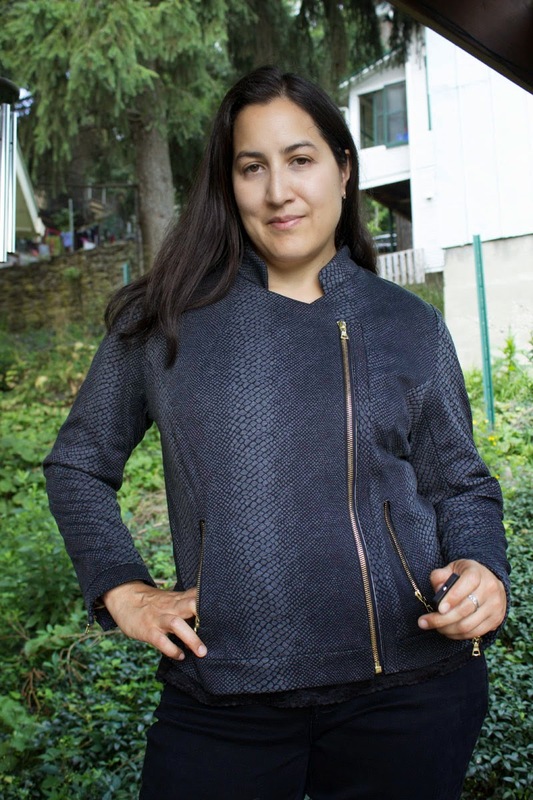 I looove my new jacket, I can't wait until it gets cool enough to wear it this fall! Oh, and here is the rolled up sleeve shot, as demonstrated by the Burdastyle model. Who wears jackets this way anyway? Not me, but it does show off those cuffs that took so much work!